Two more recordings from the Dreamblaster X2, using the new GUD Beta v0.7 sound bank and Preset Audit v2 for levels. Track one is Duke Nukem 3D’s title song ‘Grab Bag’ and track two is Doom’s E1M1 song ‘At Doom’s Gate’. This update brings the following changes to v0.6. Reduced dynamics floor to -36dB on all 128 instruments for more modern, compressed sound. It sounds better on low levels when gaming. Corrected “D149-Crash Lower” and “D157-Crash” volume/velocity curves. Crash now hearable in Doom. Corrected “78-Irish Thin Whistle” sample start, volume and tuning. If you’d like to update your X2 to version 0.7 you can download the sound bank here. 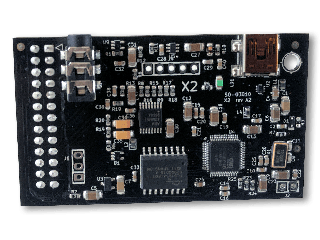 The X2 Dreamblaster is a Midi interface Wavetable board created by Serdaco BVBA a small company located in Oudenburg, Belgium. Serdaco make a whole bunch of boards, devices and kits for legacy PC sound systems, such as Wavetable header boards, a Covox Speech Thing Clone (CVX4), external adapters and interfaces. Some of which are compatible with older daughter boards and hardware. If you’re interested in retro sound hardware please check out their shop serdashop.com. Recently they have released a new beta sound bank for the X2 board named GUD 0.6 which aims to be a more balanced general midi compliant bank. To help with testing I’ve made some recordings with the new bank. These recordings are taken from the Line-out port on the X2 and saved using Audacity and the LAME mp3 codec. Dosbox was used to play Monkey Island and Sam & Max was played in Falcosoft’s Soundfont Midi Player 4.6. First is the General Midi rendition of The Secret of Monkey Island’s intro song. The original DOS version is only MT-32 Midi compatible but that can be solved with the Ultimate Talkie Edition community patch. This patch will compile DOS and SCUMMVM compatible versions of Monkey Island with full General Midi sound and voice acting from the Special Edition Re-release. I strongly recommend grabbing a copy of that version from Steam along with LeChuck’s Revenge Special Edition too. Second is a straight up recording of the intro credits song from Sam & Max Hit the Road, the midi is ripped from the game and obtained from the Mirsoft.info Game Music Base. The GUD sound bank is shaping up to be a real upgrade to the base ‘Dream’ sound bank. If you would like to try the beta bank its available in the Serdaco X2 downloads section. Along with instructions, existing sound banks and tools.